Alison Britton (born 1948) was part of the second wave of significant British hand-builders, one of the ‘Royal College Generation’ of the early 1970s, but in fact a potter who had begun her training at Leeds and then the Central School, with its strong emphasis on sculptural exploration. Nonetheless she has remained true to her vocation as a potter as well, making slab-constructed pieces that explore the ramifications of containment in various guises, combining her abilities as a painter with inventive forms. 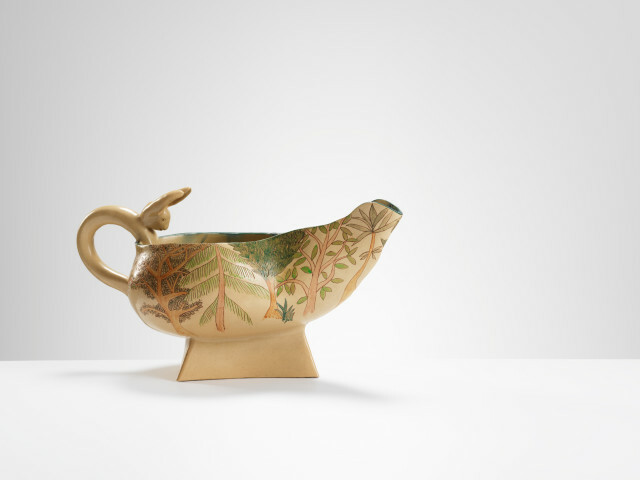 The potter William Newland was an early mentor, and in some ways the continuing spirit of slipware comes out in the painterly, often gestural aspects of her work, which can have a comparable energy of line and generosity of material. She lives and works in London.